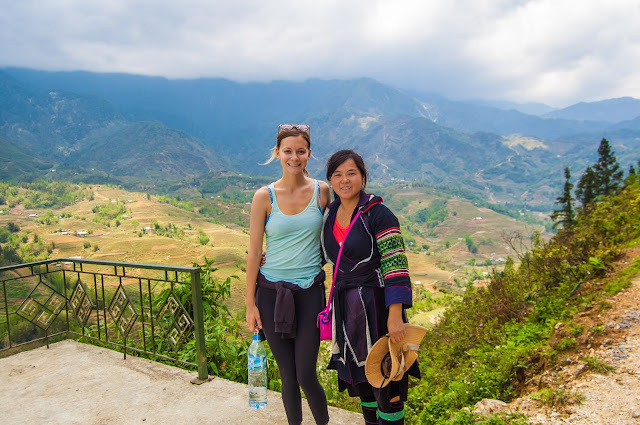 Moc Chau, a plateau of Sơn La Province, is a destination for tourists in Vietnam tourism with its wildness of green land and the paradise of flowers. Moc Chau is more and more charming because of dairy cow, green tea and especially beauty flowers. You can visit Moc Chau at any time because Mộc Châu has each kind of typical and beautiful flower for each season.That is as pink as Peach blossom branches in each spring, as purple as fresh Bauhinia variegata, as the romantic of white plum blossom in the mountains, soft and gracious white Cauliflower, eventhough they are different flowers but they all have graceful and idyllic beauty. These flowers make specific characteristic of this moutainous area. 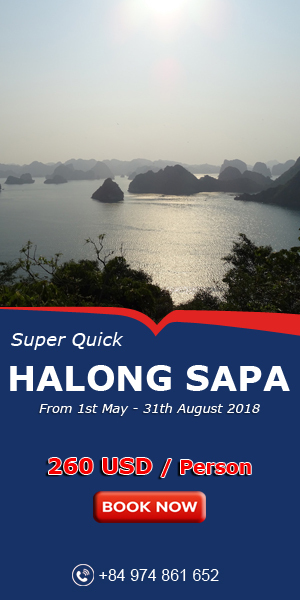 Let’s discover 4 pretty irresistible flower seasons in Moc Chau ! 1. 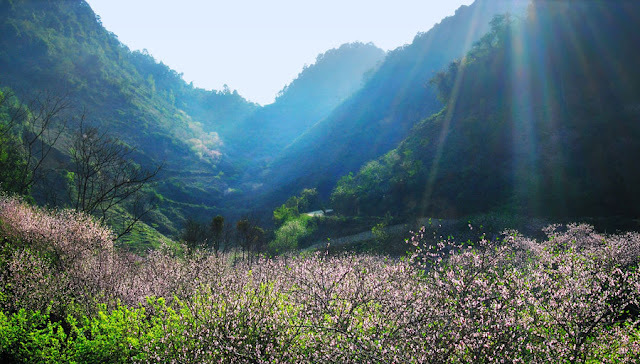 Moc Chau in Peach blossom season. When the weather getting cold at the beginning of winter, a new fragrance will adorn Moc Chau heaven and earth more warmth. Moc Chau Peach blossom belongs to France Peach blossom, they usually bloom in late autumn and early winter. Moc Chau Tourism on the first days of winter, will bring tourists an exciting experience not only in winter of Moc Chau but also early blooming of France peach blossom. France peach blossom has light color and less wings than peach blossom which blooms in each Lunar New Year in Moc Chau. The pink color from Peach blossom covers every walkways, peach blossom consider as blush face of the people here each winter on. 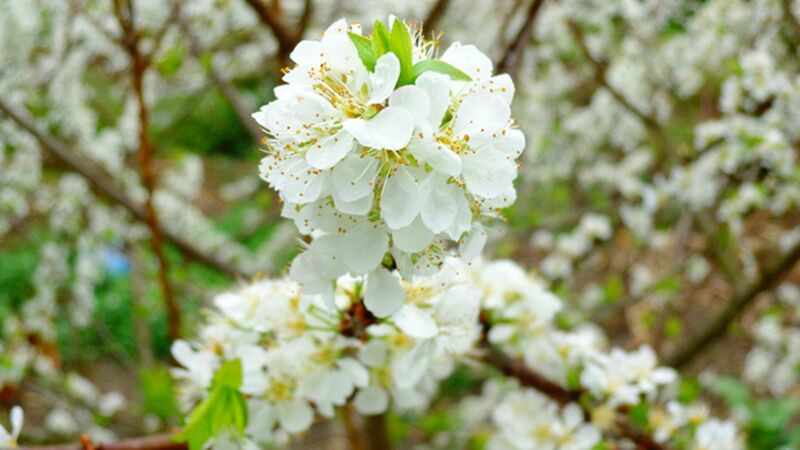 Moc Chau peach blossom is like the beauty of gentle and fresh soul of the native population to welcome visitors far away, it make visitors love country Moc Chau more. 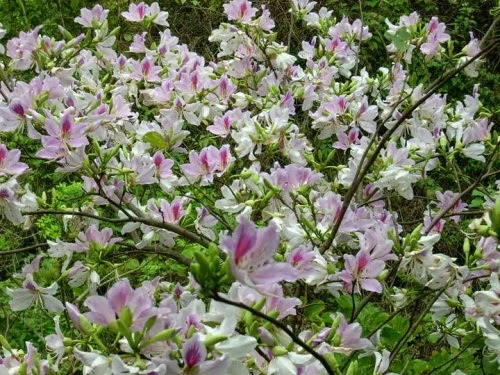 Bauhinia variegata is one of the objects of Northwest majestic mountain and this flower has become a symbol of Northwest going to poem and people's heart. This flower usually blooms about from March to April when peach and plum flowers fade. 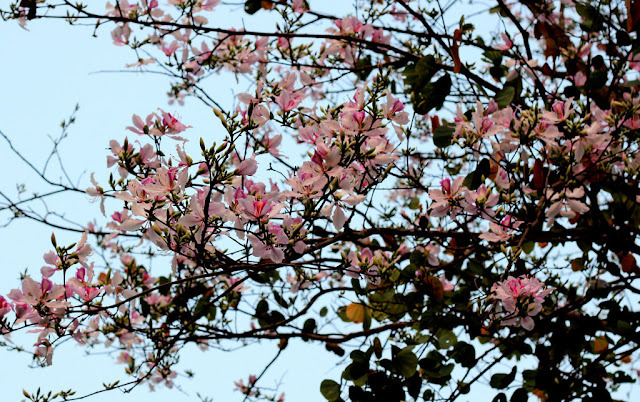 , At that time, Moc Chau is the paradise of the Bauhinia variegata. Across the streets Northwest and Moc Chau, the flowers bloom and paint under the blue sky, interpose in the trees and grass or get graceful along with traditional custome of Thai girl. Bauhinia variegata like the Thai girl, they have humble and natural beauty, but fascinated gaze of tourists who come to Moc Chau. Someone similed " Bauhinia variegata blooms Thai girl" is also for this reason. On this occasion, you will have chance to join Het Cha festival of Thai people. 3. Moc Chau in Plum blossom season. About January or February, white plum flowers bring the romantic and poetic scene. Plum flowers bloom very quickly in about 2-3 weeks. When plum flowers blossom, you will feel like walking on clouds when going under the plum trees because plum blossom everywhere in the Phieng Stems, Pa Phach, Loong Luong, plum blossom connect closely early life of people in Moc Chau.. With white plum blossom is seen as a characteristic beauty of Moc Chau which not every place has. Moc Chau is like the glorious painting of nature where the plum blossom, the virgin white of the cauliflower and the shy pink of cherry mix together to create a true heaven on earth. 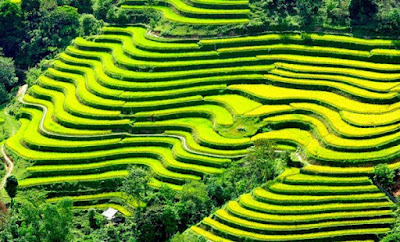 For a long time ago, when we talked about Moc Chau, we talked about the green of miles and miles of tea fields, about the blue mountains in the far away. But now, when we talk about Moc Chau, we talk about the whiteness of a thousand flowers that no one should ever miss. The plum and cherry seasons come in the early days of spring, and the scene is unforgettable. 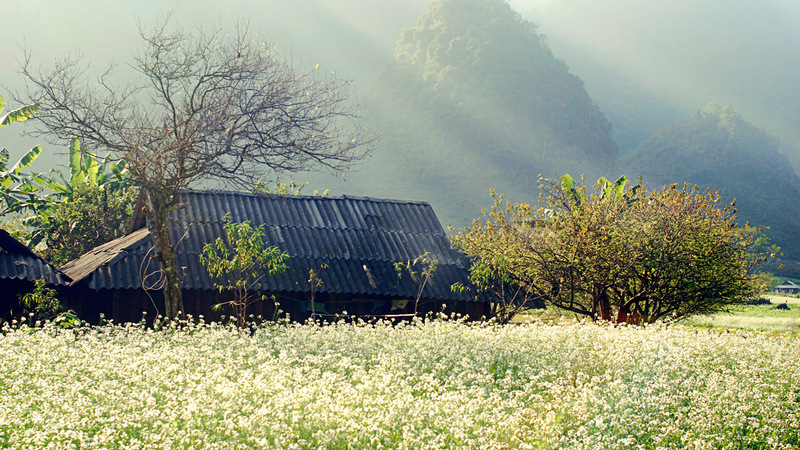 Moc Chau, in the seasons of the flowers, is a heaven in the cloud. 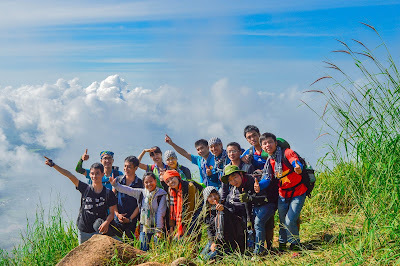 From the 6th Road to Moc Chau, the way to heaven appeared to be opened for us. Above us, the clear blue sky of spring and with us was the thick green of the middle mountains of heaven. And finally, we came to heaven. In front of our eyes was the white of the plum, the scattered red of new cherries. From above, the plum trees connected into a giant cloud covered the mountain range. However, when you are close enough, each blossom was like a piece of light from the sky. If you come to Moc Chau from end of October to December, you will be amazed at the fields and valleys with white blooming cauliflowers. Whiteness of flowers spreads throughout the space and creates a fairytale and romantic landscape. In this time, in addition to cauliflowers, Moc Chau is also more colourful with brilliant yellow wild sunflowers. Blooming flowers along the streets always make tourists stop to enjoy and take photos. Unlike many other places, the basket of flowers wrap only in a small field, in Moc Chau, the flowers are grown containing a hill, extending from this valley to the other foothills, the vast space covered by a pure white color of cauliflower. White cauliflower blooming season is the time Moc Chau become the most beautiful! You can contemplate the cauliflower in many places in Moc Chau because they grow everywhere. A small tip for visitors is that the excellent place to contemplate the beauty of cauliflower is after the pine forest of Ang village, Ba Phach 1, 2, 3 villages and Ngu Dong Ban On area. In particular, after the pine forest of Ang attracted the most, with dozens of hectares of cauliflower, visitors will think that cauliflower garden seem never end, run to the distant horizon.